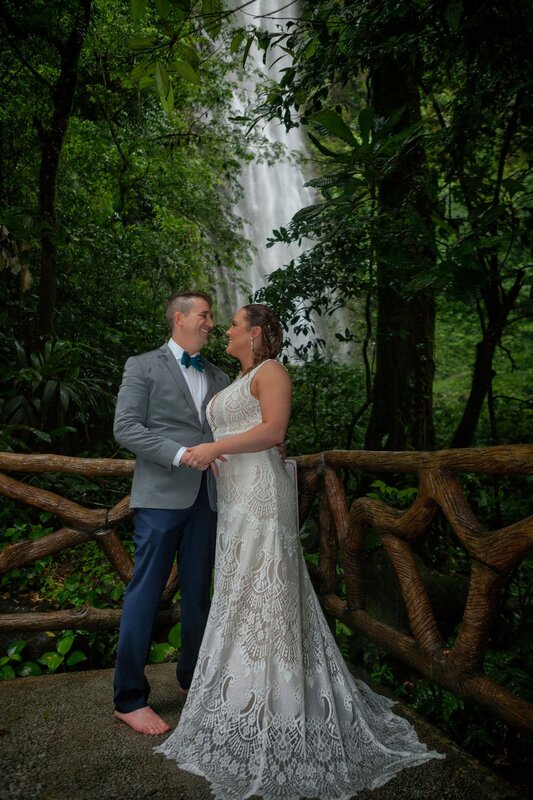 Congrats to Susan + Ryan for their beautiful wedding at the gorgeous Tabacon Grand Spa Thermal Resort, a luxurious 5-star hotel. This resort is located in the Northern Region of Costa Rica, at the base of the Arenal Volcano, 13 Km. West of La Fortuna de San Carlos, and 6 Km. East of the Arenal Lake. It borders the Arenal Volcano National Park and its exceptionally rich biodiversity. More than 100 species of mammals, 350 different species of birds and a large variety of amphibians, reptiles and insects live in this Park. Its vegetation consists of over 500 plant species. In this setting there are abundant quantities of the first natural element: WATER. Several hot mineral springs join to provide a unique, unparalleled experience. 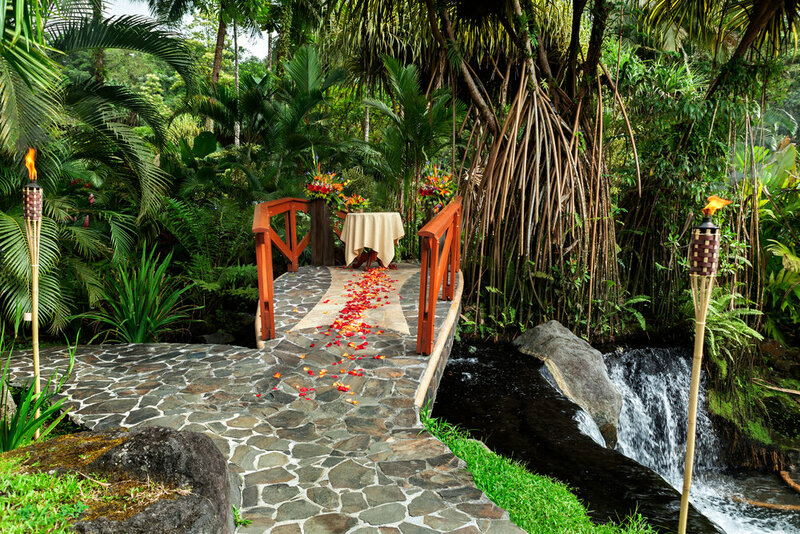 The Tabacon River flows through exuberant ecological gardens, forming natural hot mineral water pools and waterfalls, at temperatures reaching 39 deg; C (102&deg; F), and open to all visitors. From the Netherlands to Playa Conchal. Lysanne & Ernst at Playa Conchal, the sand is of this beach is composed of millions of tiny crushed shells that rustle beneath your feet. The mesmerizing beach is surrounded by turquoise waters, and it sits in a bay next to Playa Brasilito. The clear waters of Playa Conchal make it a wonderful place for swimming or snorkeling with an array of tropical fish. The Destination Wedding of Your Dreams. 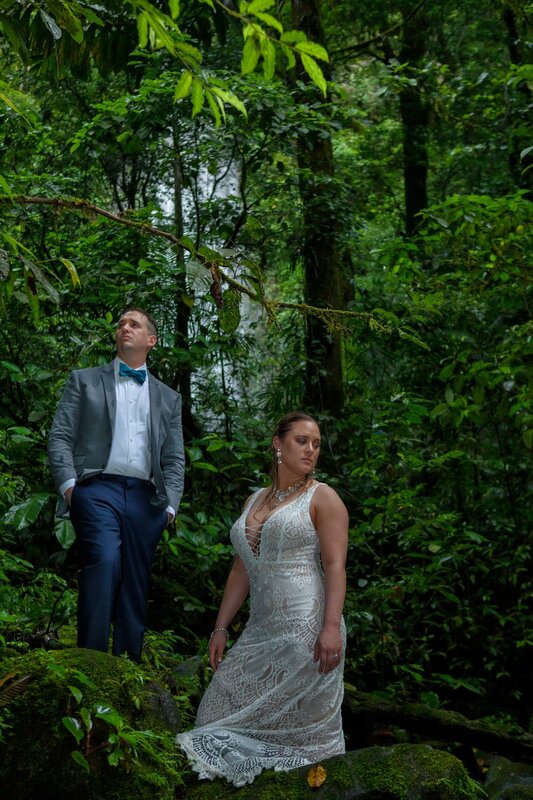 Jill & David decide to getting married at the tranquil beach of Ocotal, that is situated in Costa Rica's stunning Guanacaste Province on the northern Pacific coast. In Guanacaste, there is a world of pristine white sand beaches lined with swaying palm trees, endless summer days, and breathtaking sunsets. The region is home to a vast stretch of tropical dry forest that houses abundant wildlife and beautiful birds. Nearby Playa Ocotal, restaurants, bars, luxury and budget hotels, discos, casinos, and plenty of nightlife fun can be found at Playas del Coco, the largest village in the Guanacaste Province. Adjoining Playa Coco is the exotic beach of Playa Conchal, with a seashore made up of millions of tiny, crushed shells. A great advantage of traveling to Playa Ocotal and the surrounding Guanacaste beaches is the close proximity to the Liberia International Airport, which facilitates easy-access to the region. Ashley & Tyler getting married at Pangas Beach Club in the pristine Tamarindo Beach. Tamarindo has evolved to be the area’s most developed and accessible tourist town. Located on the central west coast of the Nicoya Peninsula, Tamarindo offers visitors of every budget a chance to experience the region’s unspoiled beaches and incredible biodiversity in a range of accommodations. Despite the town’s recent and ongoing development, it retains the laid-back vibe that is so characteristic of the region. About Pangas Beach Club. The restaurant itself is located right at the end of the beach & has a very cool, modern vibe. The food is delicious, the best food you can have in the area. We are back with a new energy and fresh photography style, now we are offering a full B & W packages. Contact us regarding more info.